The participation fee covers local housing during the project, three vegetarian meals a day, ground transportation to and from the airport and project site, local excursions, short-term travel insurance, a Maranatha t-shirt, and luggage tags. Children 12 and under have a $150 discount. Flights, passports, and vaccinations are not included in the participation fee. On September 18, 2017, Hurricane Maria, a category 5 hurricane, plowed into Dominica. Rain and winds of more than 200 mph tore through the country. More than two dozen people lost their lives. Thousands of homes were impacted. Out of the 34 Adventist churches on the island, 28 were damaged or destroyed. Later that year, Maranatha received the request for rebuilding assistance from the Adventist Church in Dominica. Volunteers on this project will start the construction of the Wesley Adventist Church’s community service building which was completely leveled by the hurricane. Volunteers will start the masonry construction of the walls. In addition to the construction, there are many needs on the island. If there are enough volunteers and leadership, there will be opportunities to spread hope and joy to these individuals through a variety of outreach activities such as children’s ministry programs and health education. 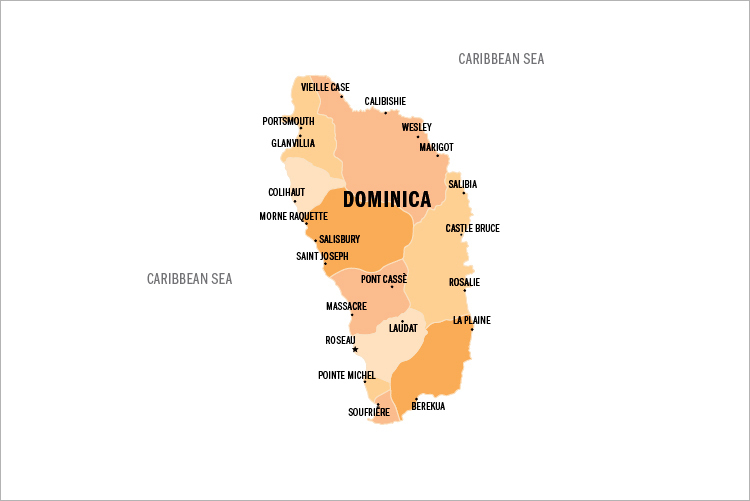 ARRIVALVolunteers will arrive in Dominica (DOM) on Wednesday, February 20, 2019.Please wait for confirmation from Maranatha before purchasing your airfare to ensure there is still space on the project. DEPARTUREVolunteers will depart from Dominica (DOM) on Sunday, March 3, 2019. Accommodations on the island of Dominica are quite limited especially after the hurricane. Volunteers on this project will truly become a family as they stay together in houses near the job site. Depending on the number of people who register and if there are couples, volunteers will be divided into several rooms that have single or double beds. There is also plenty of floor space, and depending on the number of volunteers, we may need some people to bring air mattresses or sleeping pads to sleep on the floor in the large rooms. All volunteers will need to bring their own bedding (pillows, sheets and blankets or light sleeping bag) as well as towels and washcloths. For those using the mattresses there, you may consider bringing a simple mattress cover for an added layer of cleanliness. Some of the rooms have floor fans, and some do not, so you may consider bringing a battery-operated fan to help keep your area cooler. Wi-Fi is not available. Volunteers will purchase their own plane tickets and from the Douglas-Charles Airport in Dominica. The dates posted are the arrival and departure dates from the project, but due to travel time, you may need to leave a day or two before the arrival date. You may have an overnight layover on another Caribbean island due to the connections available. Maranatha representatives will meet volunteers upon arrival in Dominica. Please wait for confirmation before purchasing your airfare to ensure that there is enough space on the project. More information is available in an information packet available for download above. Booking outside these arrival and departure windows could result in additional fees and missed portions of the project. During the project, the group will take a day to tour some sites in Dominica. We’ll head to the capital city of Roseau for some souvenir shopping. We’ll also be able to go on hikes to visit the island’s beautiful natural landscape, including waterfalls and mountains. There are also beautiful beaches that the group can enjoy during the trip. Volunteers will also have the option to SCUBA dive or snorkel for an additional cost. The Dominica Project has ended, please view our Volunteer Opportunities page for upcoming projects.